Our fully mobile service is available to service clients located in The City of London, Westminster, Camden, Islington, Kensington & Chelsea, Hammersmith & Fulham, Hounslow, Ealing, Hillingdon, Brent, Harrow, Richmond, Kingston, Sutton, Croydon, Bromley, Merton, Lambeth, Wandsworth, Lewisham, Southwark, Greenwich, Bexley, Tower Hamlets, Newham, Hackney, Barking, Barnet, Haringey, Enfield, Waltham Forest, Redbridge and Havering on a SAME DAY repair basis, meaning you are not left without your vehicle for an extended period of time. 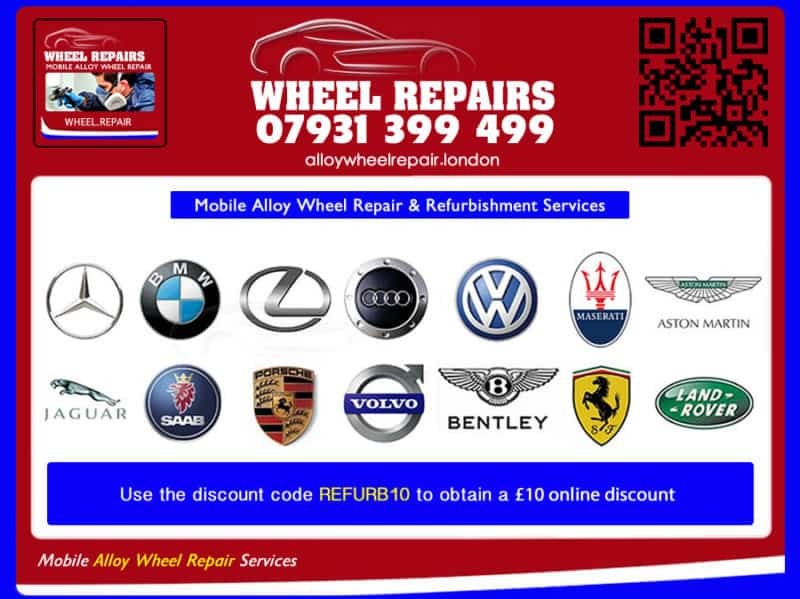 Whether you are looking to have your scratched / scuffed alloy wheels repaired or whether you wish to change the colour of your alloy wheels, we can assist owners of Alfa Romeo, Aston Martin, Audi, Bentley, BMW, Chevrolet, Citroen, Ferrari, Fiat, Ford, Honda, Jaguar, Jeep, Lamborghini, Land Rover, Lexus, Lotus, Maserati, Mazda, Mercedes Benz, Mini Cooper, Mitsubishi, Nissan, Peugeot, Porsche, Renault, Rolls Royce, SAAB, SEAT, Skoda, Subaru, Suzuki, Toyota, Vauxhall, Volkswagen and revive dull, scratched and scuffed alloy wheels, with guaranteed quality finishes. 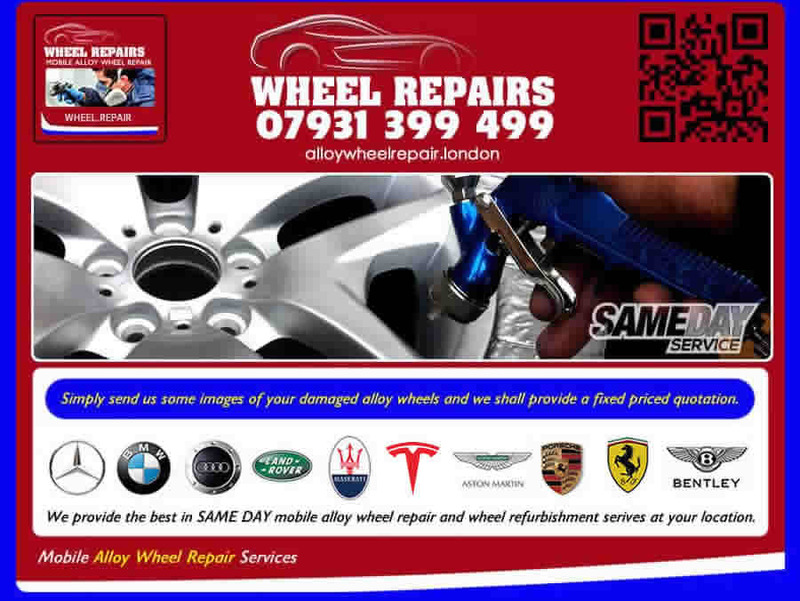 Our services are retained by private and commercial clients who require a mobile wheel refurbishment solution that is responsive and provides great customer service and high quality workmanship. We can provide clients with a variety of finish options for their alloy wheels and can even provide clients with diamond cut/machined alloy wheels with bespoke finishes such as gloss black if required. 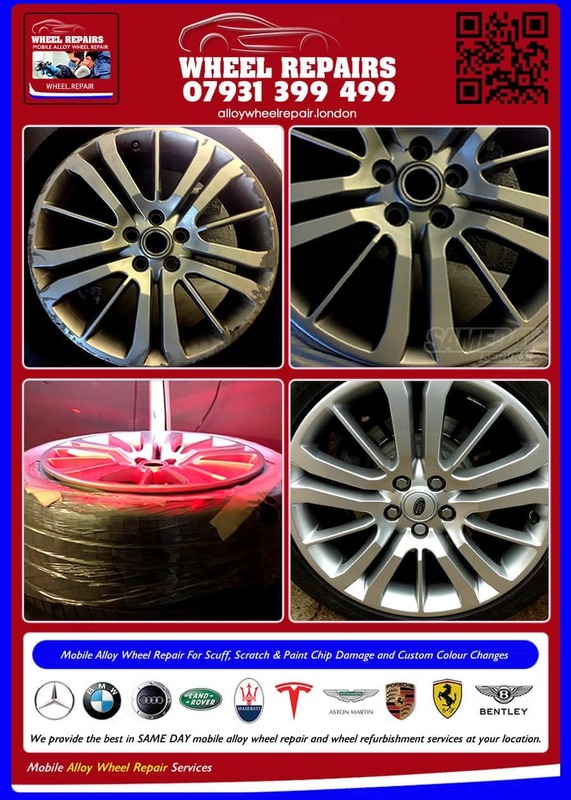 Simply take an image of each of your damaged alloy wheels, showing the full circle of the wheel and let us know what you would like to do at the time of your enquiry and we shall do our best to assist and get your alloy wheels looking smart again. 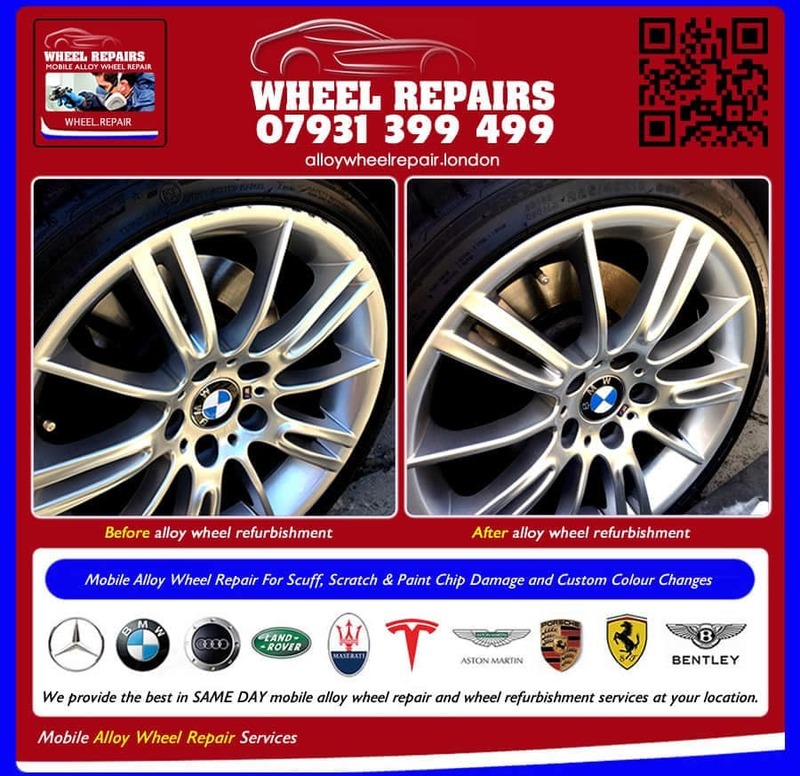 Call 07931 399 499 or contact us via the enquiry form and we shall provide you with a fixed price quotation to repair your damaged alloy wheels onsite at your location in London. Service Overall rating: 4.8 out of 5 based on 14 reviews.